The Gemini Jets Airport features a complete airport display including an airside area featuring 5 narrow-body gates, 2 wide-body gates, and regional jet parking aprons. 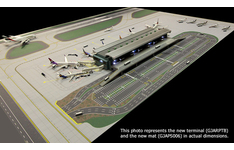 Additional features include a full 1/400 scale multi-level arrivals and departures landside area terminal with elevated roadway and car park. The included terminal building is pre-constructed from quality resin and includes 7 moveable passenger jet ways, with realistic and authentic detailed graphics along with a fully functioning multi-coloured LED lighting system for optimised presentation. Included as additions to the Gemini Jets Airport we also have a number of ground accessories and additional jet-ways which can be purchased for those looking at expanding their scaled airport. Gemini Jets 1:200 Widebody Wooden Display Stand, suitable for use with selected 1:200 scale aircraft..
AIRPORT TERMINAL: - Pre-constructed single piece contemporary airport terminal. - Resin constr..
Gemini Jets Aiport 1:200 American Airlines Ground Support Equipment (GSE) suitab..
Gemini Jets Aiport 1:200 Delta Air Lines Ground Support Equipment (GSE) suitable..